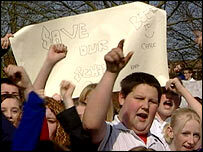 About 200 children have staged a demonstration over plans to merge their school with another. Pupils are angry at plans which would mean the end of Drayton School in Banbury, Oxfordshire. Officials want to merge Drayton with its neighbour Banbury School, creating a new school with more than 2,000 pupils. The children say a new merged school would be too big and impersonal. Dean Sefton, from Year 11 in Drayton School, said: "They'd be in a school where there's thousands of people and they won't know half of them, whereas here they know everybody." 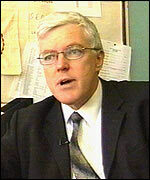 Headteacher Graham Robb said: "It's very controversial - I understand that. "It is the biggest change in Banbury's education for 30 years. "But I wouldn't be fulfilling my responsibility if I didn't say to the community that there is a real problem with the schools carrying on as they are. "This is an amalgamation proposal to let us provide the level of quality education that has to be provided in Banbury in the future." Many parents who also attended the demonstration disagree that the merger would be beneficial. Margaret Peacock, whose daughter attends Drayton School, said: "I think it's wrong - she's gotten on really well and the teachers are so so nice. "Going to a bigger school - she's not going to get the qualifications, the education because there are too many children." Banbury School, a couple of miles away, is much larger than Drayton. It is right next door to Blessed George Napier Catholic School. Under the proposals, this would move to the site currently occupied by Drayton School - leaving a large site available for the new merged school. It would be one of the biggest schools in the county. The plans have not yet been finalised but if they are approved, work could begin in September next year.